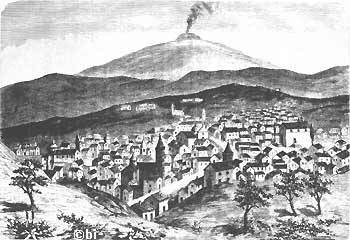 From August 28 of 1887 up to the beginnings of December of the same year, as in other zones of Italy, also in Bronte a violent cholera epidemic burst. Because of the cholera epidemic, with royal provision the Municipal Council was dissolved and an Extraordinary Delegate was nominated for such a period, with full powers, the lawyer Giuseppe Sorge. (Benedetto Radice writes that "the mayor and the assessors run away"). To the Scialandro it was built, a suitable Municipal Lazaretto with wooden tables and instituted economic kitchens to shelter both the sick brontese persons that did not have the means to cure themselves in their own homes and who, coming from near towns did not have an accommodation. To facilitate the night transit in the roads for those courageous ones that were nursing the sick, the lighting was kept up till dawn. The number of street cleaners was increased, it was forbidden to let pigs and hens wander in the streets or keep them in the houses and to throw in the streets "materie immonde" (filthy matters), that infected and make the air stink. Bronte, with a population of about 20.000 inhabitants had, in that year, 552 cases of cholera and over four hundred deaths. Please out in Between those that distinguished themselves during the raging of the disease, helping the population, challenging dangers and wariness are worth remembering: the historian Benedetto Radice, the doctor Filippo Isola, Arcidiacono (commissary to hygiene), dr. Miraglia (director of the sanitary office), dr. Licciardelli (director of the Lazaretto), the assessor Avv. De Luca, Mariano Lo Turco, Serafino Venia, Giacomo Barnabas, Mons. Dusmet (archbishop of Catania), the Members of Parliament Finocchiaro Aprile and De Felice, the Duke Nelson (who put a large amount of wheat at disposal of the Council), dr. Vincenzo Cervello. An image of old Bronte taken from the "History of the city of Bronte" by father Gesualdo De Luca (Milan, San Giuseppe typography, 1883). The church and the convent of San Vito are visible (to the right on top ), the Church Of The SS. Trinità (the matrice, at the center) and the church of Annunziata (on the left). This last, distinguished professor of medical chemistry, named by the government, during the cholera epidemic, sanitary director for the provinces of Messina and Catania, deserved also the gold medal as well deserving of the public health (a hospital in Palermo has been entitled to him). In that "mournful" year end 1887 was just ceased the terrible cholera epidemic little and were already beginning the first hotbeds of smallpox and the malarial fevers. The causes, besides the natural factors, were to be attributed, above all, to lack of hygiene. «In fact often the population drinks water from the wells which were near to permeable cesspools"; the habit to throw the "garbage" in the streets, with the consequence to cause the pollution of the underground water table, principal cause of all infectious diseases» (relation to the Council of Bronte red, in the session of 11.26.1887, by the royal extraordinary delegate avv. Giuseppe Sorge). "A certain common man, nicknamed Scoglio, was prejudicially considered by the same fellow villagers, a cholera spreader (similarly of the "un­tori" of manzonian memory). Ferociously persecuted everywhere, he begged the local authorities, to put him in prison as "captive volunteer" in order to escape the horrible persecution. At least, he believed so. Months later, when the epidemic had ended he wanted to be let out free again. Should have never done it! One day, in a countryside road, he was met, accidentally, by a good number of citizens who started to stone him tom death. Realizing that was lost, he drew some bread from his knapsack, started to crumble it spouting the crumbs in their direction and loudly shou­ting: "run away or I'll poison you! !, run away"! The group, wrong footed by the gesture and the words of the Scoglio, retreated but when reassembled decided to kill a such a wicked and pitiless man. Then, overcoming the fright they had felt earlier, ran back again throwing stones at him until he, badly hit, fell to the ground and died."